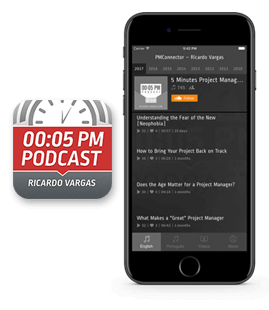 Since 2007, Ricardo Vargas publishes the 5 Minutes Project Management Podcast where he addresses in a quick and practical way the main topics on project, portfolio and risk management. Notice: The 2008 episodes were only recorded in Portuguese. In this hundredth podcast, Ricardo makes a retrospective of the year and explains that 2008 was an excellent year for project management in Brazil. He says that Brazil gained greater importance in the world and that many Brazilians got certified or sought a postgraduate course in project management. This podcast was recorded only in Brazilian Portuguese. The link below is for the Brazilian Portuguese version. In this podcast, Ricardo presents his perceptions about one of the cities with biggest rate of growth worldwide, where a infinitude of giant projects are now undertake in order to transform Dubai into the touristic and economic. This podcast was recorded only in Brazilian Portuguese. The link below is for the Brazilian Portuguese version. In this podcast, Ricardo try to differentiate the concept of project management and product management (management of the product generated by the project. Despite of the same origin, the approach strategies of this 2 management practices are significantly different. This podcast was recorded only in Brazilian Portuguese. The link below is for the Brazilian Portuguese version. In this podcast, Ricardo explains what is, how works and how relevant is the project change control board (CCB), the most important team inside each project. This podcast was recorded only in Brazilian Portuguese. The link below is for the Brazilian Portuguese version. In this podcast, the Ricardo talks about Rolling Wave Planning. He explained that the planning is more detail in the near term and detail in high level in the far term. Ricardo notes that this procedure is indicated when the project has a long duration (more than 1 year), where the horizon and estimate of cost and time is poor. This podcast was recorded only in Brazilian Portuguese. The link below is for the Brazilian Portuguese version. In this podcast Ricardo talks directly from Kingston - Jamaica the main topics of the International Project Management Day, an event with the participation of the Minister of Energy, Mr. Clive Mullings. At the event, were discussed themes as globalization, sustainable growth and best practices. This podcast was recorded only in Brazilian Portuguese. The link below is for the Brazilian Portuguese version. In this prodcast, Ricardo talks about the Stockholm Syndrome when it comes to projects. Ricardo shows that sometimes the project manager fails to report relevant events in order to not harm the relationship with the customer. This protective relationship to the customer can be bad for the project. This podcast was recorded only in Brazilian Portuguese. The link below is for the Brazilian Portuguese version.